As we have already understood basic positioning of the head over platters and the common coordination systems used, we should investigate the spindle itslef. First of all – what is a hard drive spindle? 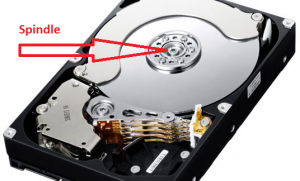 Roughly said, a hard drive spindle is the motor that rotates the platters with the shaft to which they are attached. All platters are attached to it, so they cannot slip or move in any way on their own. The spindle is rotating constantly as the hard drive is turned on, expect when it enters a sleep mode(power saving) or when it fails(and the firmware cuts the power supply to the spindle to prevent rotation, which may cause further damage on the platters). A spindle can carry from one to a few platters. Usually two or three, rarely four and very very rarely more than this. Why the spindle doesn`t carry more platters? More platters means more space to write on and therefor a bigger capacity! Well, this is true – one platter may hold for example 250GB of information(125GB per each side), so a hard drive with two of those platters will be 500GB and with three platters it would be a 750GB drive in our example. Yet, adding platters comes at a cost. Rotating one platter is easy for the spindle. Rotating two platters is a hevier job for the motor – it has to be stronger and will consume more energy, meaning it will heat up more and it will be more noisy. And from there comes a high stability impact – low loaded spindles have bigger life, while heavier spindles have to rotate higher weight and are wearing off easier. This means that in practise a spindle with one platter has less chance of failing due to motor problems, compared to a spindle with two or more platters. Is there something else that impacts spindle life cycle? Yes, of course there is something else. In addition to weight load from the platters, the life cycle of a spindle includes the speed at which it is rotating. Back in the days i recall having hard drives rotating at 3600 and 4200 rounds per minute(rpm). Now the most common standarts are 5400 rpm(for a laptop hard drive) and 7200 rpm(for a desktop hard drive). But first of all – why is a spindle speed important? Well, the faster a spindle rotates, the faster access to a certain sector can be performed. 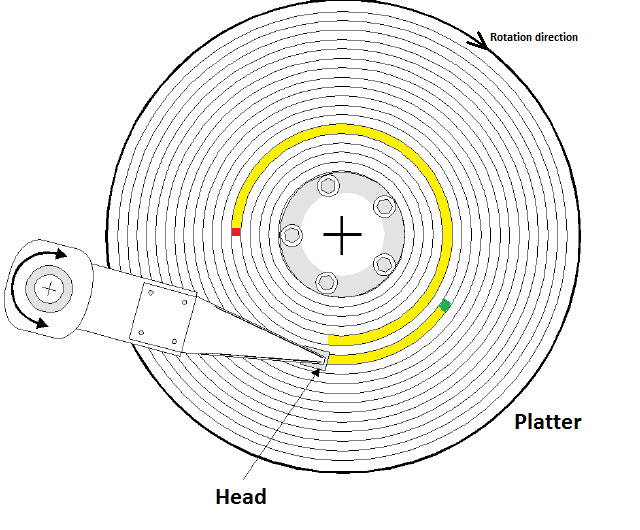 Imagine that the sector you want is far away from the read head, so the platter has to rotate by 3/4th cycle, so the head can go over the sector. If the drive rotates slowly, this will take more time. So the faster the drive rotates – the faster access on data you can have. The delay caused by accessing the sector is called seeking time. This is the time it takes until a hard drive is able to locate the sector and fetch it as requested. Usually you can find an indicator for seeking time in the hard drive specifications – an average seek time(double it for the worst case seeking, half it for the best case seeking scenario). The longer path(for the RED sector being seeked) will take more time to trave to the head, compared to the shorter path(GREEN sector). Higher platter rotation speeds shorten both times. Yet, this is not so good. As the motor rotates at 7200 rpm, it will wear off mechanicly faster than rotating on 5400 rpm. Comparsion by those two speeds, show that the 7.2k drive will do 1800 more rounds per minute, or in total a 2 592 000 rounds more per day, that the 5.4k rpm drive. Which means that the faster rotating drive has burned in a day such resources, that will allow the slower drive to run for 8 hours. Or in other words – 7.2k rpm drives rotate 33% more than the 5.4 rpm drives, and the mechanical wearing is thus 33% higher in them, increasing the chance of mechanical failure. Simply, a slower drive could outlast a faster drive(if they use the same technology and the only different factor is the rotating speed). Adding up to this, the faster a spindle rotates, the more noise it makes. Biggest comparsion can be made from hearing to a 15.5k rpm drive against the 5.4k rpm drive – you almost won`t hear the slow one, while the faster one will make you want to scratch your eyeballs out if you listen to it constantly. Now, everything`s good, but is the spindle just a motor? Well, actually it`s not a simple motor, as it has to rotate at a certain speed and maintain it. The drive should go steady and beauty – at 7200 rounds per minute. It will not hurt if it runs at 7203 rounds per minute or 7198 rounds per minute. What matters is that it keeps them steady and unchangeable for the lifespan of the entire drive. If the drive was changing speeds, the the coordination would be lost and the magnetic heads would start reading random places, not knowing what and where to expect from the drive. And there are drives supporting two modes of working – a low one for power saving and a fast one for boosting performance. If I am not mistaken the speed were going like 3600 rpm in the slow mode and 7200 in the fast mode. This type of hybrid tech drives turned out to be quite unpopular, because they were having a lot of firmware issues – sometimes they were unable to change modes, they were messing up on read/write and so on. They had problms like any new product, but they did not survived it – the power/noise saving was too unnoticeable, but the reliability was suffering – the users denied this product and sent it to rest in pieces. This entry was posted in IT - HDD/SSD by archangel. Bookmark the permalink.